L to R Standing: Tegan Rush, Bernice Morgan, Kat Rush, Greg Morgan, Andy Rush Front Row: Jennifer Morgan and Jackie RushMorgan Happy printmakers! Maureen Booth writes from Granada–Printmaker Jennifer Morgan has confirmed for me something that I always suspected. Creative artists don’t limit their creativity just to their work. They take it with them in other aspects of their lives. Jennifer and her family were headed to Spain on a vacation organized by her mother, the Canadian novelist, Bernice Morgan. 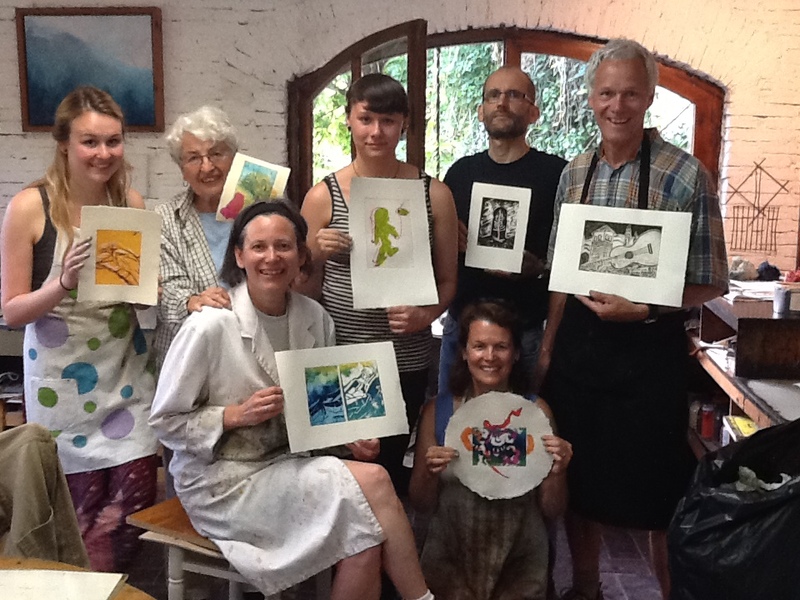 Wouldn’t it be fun, Jennifer mused, if we could find a printmaking studio in Spain willing to mount a one-day workshop for our whole family? Granada sounded good so she went to Google. I received her email shortly thereafter. Would I be willing to organize a one-day workshop for a family of seven? Sure, why not? I’d never worked with a family group before but I’d done lots of short courses for school groups. The challenge was whether we could achieve something meaningful in just one day. I decided we could give it a try if we worked both in the morning and the afternoon, with a break at midday for lunch and a short siesta. In the end my husband Mike made his specialty of the house lunch: a big paella that restored everybody’s strength and enthusiasm. My good luck was that the Morgan clan is uniformly loaded with artistic talent and they took to solarplate printmaking like ducks to orange sauce. Why solarplate? Because it speeds up the printmaking process immensely, permitting us to prepare acetates and burn plates outside in the sunshine in the morning and then dedicate the afternoon to finding creative ways of printing them. In the end they took home a big stack of prints, all of which looked as if they had been done by experienced printmakers. At the end of the day the Morgans had a 45-minute wait for the bus back to the city, so they spent it gleefully in our local bar between wine and tapas and furious games of “futbolín,” as the Spanish refer to the raucous table soccer game.